ACCA Pakistan is offering a training program on Financial Statements Analysis (FSA) in a two part series. The first part will cover the fundamental concepts using a real life financial statement as an example while the second part will entail a more complicated insight with the likes of the impact of Basel accords. 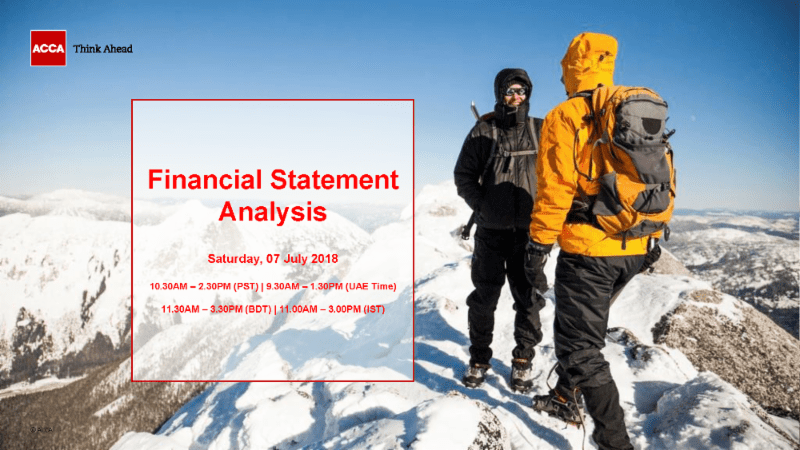 This topic is a key area of expertise for a modern day finance professional, whether one is working in a financial institution, corporate sector, a public office, investment house, applying for a financial product or approving one, they needs to be aware of the Financial Statement Analysis (FSA). The knowledge of these is of extreme importance and relevance for ACCA Members including finance professionals. Mr. Omer Zaheer Meer, FCCA is Chairman of ACCA Pakistan Member Network Panel, represents Pakistan on the Global Tax Forum and is the Chairman of ACCA Pakistan’s Taxation Subcommittee. He has extensive experience as a top taxation expert and is an exceptional trainer. He is currently the Managing Partner (Corporate Services) at Millennium Law & Corporate Company, the pioneer ACCA practising firm in Pakistan. The event will be conducted through webinar. The registration fee for this webinar is Rs.15,000 however it is free of cost for all ACTIVE ACCA Members. Those who are interested in attending the event should register by filling up the registration form available on the link below.